Ombre is becoming popular in home decor these days. It has actually been around for quite sometime. You can see it in fabrics and embroideries as late as the nineteenth century. There is some beautiful ombre fabrics available for quilting. Batiks, of course, often use this technique to great effect, but there are other printed cottons that also apply this style. 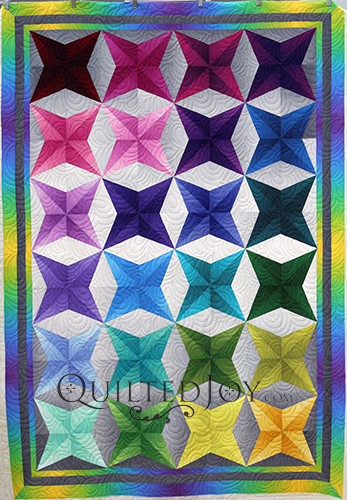 Arlene created this four point star quilt with all ombre fabrics. Doesn’t it look amazing? The design of her quilt is elegant in its simplicity. I’m not seeing a lot of seams in this, so I’m wondering if she paper pieced this top. Either way Arlene did a beautiful job. What makes this really stand out is her use of the ombre fabric. Not only are the stars ombre, but it looks like she’s cut them all to be dark in the center and then radiate out to the tips. But then she also used a white and gray ombre for the background. She managed to keep the darker grays towards the top and bottom, leaving the lighter in the middle, continuing the overall shading effect in the quilt as a whole, instead of only worrying about the effect in the individual blocks. Amazing! Even the backing uses the ombre fabric. I quilted this for Arlene with an edge to edge design called Paisley Allover. It is a gentle open design that covers the quilt with echoed curves resembling drops. Because of the echoes, the design also adds a great texture to the quilt that can make it very fun to wrap up in. It is a great addition to add some movement to a top with a lot of straight lines. I’ve always been one to use and mix a lot of prints on my quilt tops. But I’m really loving how you can play with color using ombre fabrics. It really makes your piecing stand out and be the star. It helps when you can use the shading as advantageously as Arlene has with this quilt.